Trying to figure out how to continue watering your lawn but not waste water in the mean time? Besides expensive water bills from watering the lawn in the summer, there are also water regulations that one must follow to avoid any type of penalty. There are a few ways to conserve water this summer and still have a healthy, full, green lawn. Place watering cans or another type of bucket in your yard when it is raining to collect rain water. Then you can use this water to hydrate your plants and lawn later that week instead of using your sprinklers. Try to use this water within a few days because leaving standing water for prolonged periods of time can be a breeding place for mosquitoes and dangerous to other animals as well. I think it’s safe to say that you won’t want to water your lawn while it is raining out because your lawn is getting watered for free! If you know rain is in the forecast, be sure to turn off your sprinkler timer so that way you won’t be wasting water if you’re not home. Besides rain, strong winds are also detrimental to the watering of your lawn. If wind gusts are strong, they will blow the sprinklers away from your lawn and you’ll be wasting water and your lawn will be missing out on that water. Wait until the strong winds have concluded and then water accordingly. A broken or leaky sprinkler can cause you to waste gallons if not repaired in a quick and timely fashion. 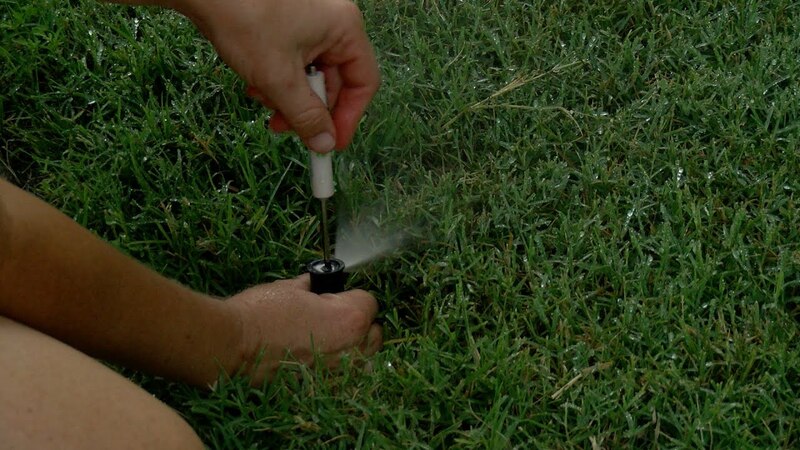 Water leaking onto the grass isn’t using its full potential and the excess water will be benefiting just one spot of grass which could possibly cause fungus. If the sprinkler isn’t repairable in a “do-it-yourself” project, then contact a local sprinkler company to fix your issue quickly. When you turn your sprinklers on for the first time of the Spring/Summer season, do a quick test to ensure that the sprinklers are faced in the correct direction. By letting sprinklers spray on sidewalks and driveways is just wasteful and takes away precious watering time from the lawn and other plants and trees. Also, if you want your lawn to get the majority of the watering time and not so much other plants and trees, then set your zones accordingly for that as well. Skimming a few minutes of watering time on each assigned day will also save water. When watering plants and other shrubs, only do so between 7:00pm and 9:00am. What surprises some homeowners the most is that it’s not necessary to water your lawn every day. It is actually recommended by many city ordinances that residents only water every third day, which is a great way to conserve water and prevent fungus from growing on your lawn as well, which can happen actually quite frequently in the warmer summer months. If you are under water restrictions, be sure to water between the designated hours that is allowed. Usually lawn watering is most preferred after the heat of the midday sun, so that the warm temperatures don’t affect how much water is actually obtained by your lawn. Have additional questions about lawn care? Visit our Minneapolis lawn care page for more information and ways to get in touch. The post Reminder: Tips to Conserve Water on your Minneapolis Lawn appeared first on Lawnstarter.